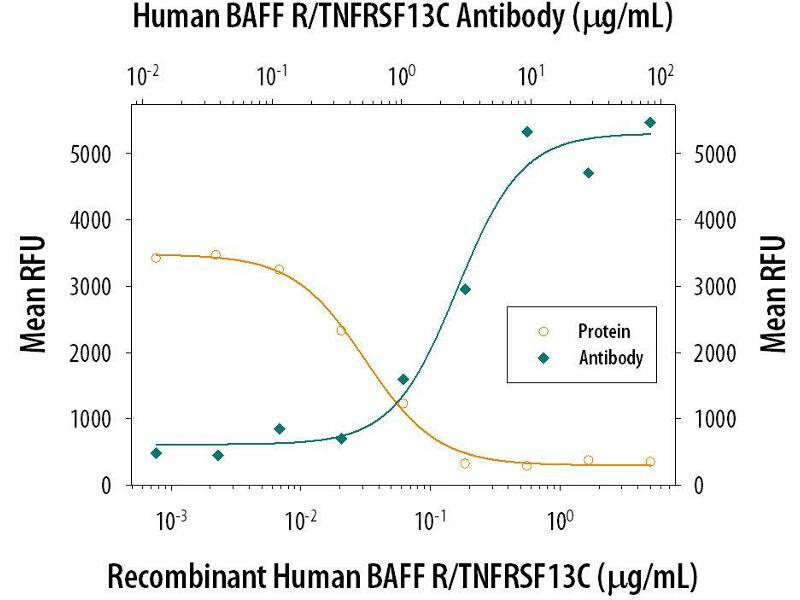 BAFF R/TNFRSF13C Inhibition of BAFF/BLys/ TNFSF13B-dependent Cell Proliferation and Neutralization by Human BAFF R/TNFRSF13C Antibody. 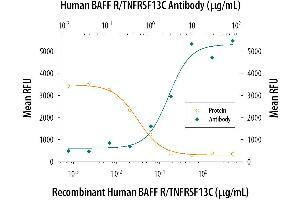 Recombinant Human BAFF R/TNFRSF13C Fc Chimera. The ND50 is typically 3-15 ug/mL. 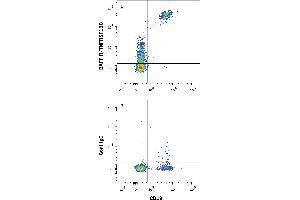 Detection of BAFF R/TNFRSF13C in PBMCs by Flow Cytometry. 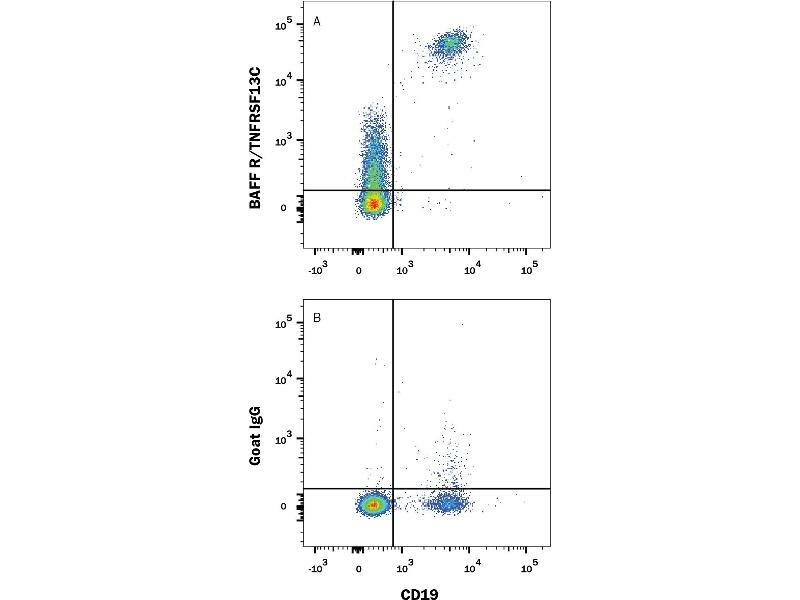 Peripheral blood mononuclear cells (PBMCs) were stained with Mouse Anti-Human CD19 Fluorescein-conjugated Monoclonal Antibody. Specificity Detects human BAFF R in direct ELISAs and Western blots. In direct ELISAs and Western blots, less than 5 % cross-reactivity with recombinant mouse BAFF R and less than 2 % cross-reactivity with recombinant human (rh) 4-1BB, rhCD27, rhCD30, rhCD40, rhDR3, rhDR6, rhEDAR, rhFas, rhGITR, rhHVEM, rhNGF R, rhOPG, rhRANK, rhTNF RI, and rhTNF RII is observed. Saulep-Easton, Vincent, Quah, Wei, Ting, Croce, Tam, Mackay: "The BAFF receptor TACI controls IL-10 production by regulatory B cells and CLL B cells." in: Leukemia, Vol. 30, Issue 1, pp. 163-72, 2016 Method employed by authors: Neutralization (Neut), Neutralization (Neut), Neutralization (Neut) (Sample species: Human). Maddur, Sharma, Hegde, Stephen-Victor, Pulendran, Kaveri, Bayry: "Human B cells induce dendritic cell maturation and favour Th2 polarization by inducing OX-40 ligand." in: Nature communications, Vol. 5, pp. 4092, 2014 Method employed by authors: Neutralization (Neut), Neutralization (Neut), Neutralization (Neut) (Sample species: Human). Notas, Alexaki, Kampa, Pelekanou, Charalampopoulos, Sabour-Alaoui, Pediaditakis, Dessirier, Gravanis, Stathopoulos, Tsapis, Castanas: "APRIL binding to BCMA activates a JNK2-FOXO3-GADD45 pathway and induces a G2/M cell growth arrest in liver cells." in: Journal of immunology (Baltimore, Md. : 1950), Vol. 189, Issue 10, pp. 4748-58, 2012 Method employed by authors: Immunocytochemistry (ICC), Immunocytochemistry (ICC), Immunocytochemistry (ICC) (Sample species: Human). Ohmatsu, Sugaya, Miyagaki, Suga, Fujita, Asano, Tada, Kadono, Sato: "BAFF levels are increased in lesional skin and sera in patients with cutaneous T-cell lymphoma." in: The British journal of dermatology, Vol. 167, Issue 2, pp. 359-67, 2012 Method employed by authors: Immunohistochemistry (Paraffin-embedded Sections) (IHC (p)), Immunohistochemistry (Paraffin-embedded Sections) (IHC (p)), Immunohistochemistry (Paraffin-embedded Sections) (IHC (p)) (Sample species: Human). Luster, Mukherjee, Carrell, Cho, Gill, Kelly, Garcia, Ward, Oh, Ullrich, Migone, Humphreys: "Fusion toxin BLyS-gelonin inhibits growth of malignant human B cell lines in vitro and in vivo." in: PLoS ONE, Vol. 7, Issue 10, pp. e47361, 2012 Method employed by authors: Neutralization (Neut), Neutralization (Neut), Neutralization (Neut) (Sample species: Human). Yeramilli, Knight: "Requirement for BAFF and APRIL during B cell development in GALT." in: Journal of immunology (Baltimore, Md. : 1950), Vol. 184, Issue 10, pp. 5527-36, 2010 Method employed by authors: Flow Cytometry (FACS), Flow Cytometry (FACS), Flow Cytometry (FACS) (Sample species: Human). Badr, Borhis, Lefevre, Chaoul, Deshayes, Dessirier, Lapree, Tsapis, Richard: "BAFF enhances chemotaxis of primary human B cells: a particular synergy between BAFF and CXCL13 on memory B cells." in: Blood, Vol. 111, Issue 5, pp. 2744-54, 2008 Method employed by authors: Flow Cytometry (FACS), Flow Cytometry (FACS), Flow Cytometry (FACS) (Sample species: Human). Neri, Kumar, Fulciniti, Vallet, Chhetri, Mukherjee, Tai, Chauhan, Tassone, Venuta, Munshi, Hideshima, Anderson, Raje: "Neutralizing B-cell activating factor antibody improves survival and inhibits osteoclastogenesis in a severe combined immunodeficient human multiple myeloma model." in: Clinical cancer research : an official journal of the American Association for Cancer Research, Vol. 13, Issue 19, pp. 5903-9, 2007 Method employed by authors: Flow Cytometry (FACS), Flow Cytometry (FACS), Flow Cytometry (FACS) (Sample species: Human). Ettinger, Sims, Robbins, Withers, Fischer, Grammer, Kuchen, Lipsky: "IL-21 and BAFF/BLyS synergize in stimulating plasma cell differentiation from a unique population of human splenic memory B cells." in: Journal of immunology (Baltimore, Md. : 1950), Vol. 178, Issue 5, pp. 2872-82, 2007 Method employed by authors: Flow Cytometry (FACS), Flow Cytometry (FACS), Flow Cytometry (FACS) (Sample species: Human). Elsawa, Novak, Grote, Ziesmer, Witzig, Kyle, Dillon, Harder, Gross, Ansell: "B-lymphocyte stimulator (BLyS) stimulates immunoglobulin production and malignant B-cell growth in Waldenstrom macroglobulinemia." in: Blood, Vol. 107, Issue 7, pp. 2882-8, 2006 Method employed by authors: Flow Cytometry (FACS), Flow Cytometry (FACS), Flow Cytometry (FACS) (Sample species: Human). Ogden, Pound, Batth, Owens, Johannessen, Wood, Gregory: "Enhanced apoptotic cell clearance capacity and B cell survival factor production by IL-10-activated macrophages: implications for Burkitt's lymphoma." in: Journal of immunology (Baltimore, Md. : 1950), Vol. 174, Issue 5, pp. 3015-23, 2005 Method employed by authors: Neutralization (Neut), Neutralization (Neut), Neutralization (Neut) (Sample species: Human). Moir, Malaspina, Pickeral, Donoghue, Vasquez, Miller, Krishnan, Planta, Turney, Justement, Kottilil, Dybul, Mican, Kovacs, Chun, Birse, Fauci: "Decreased survival of B cells of HIV-viremic patients mediated by altered expression of receptors of the TNF superfamily." in: The Journal of experimental medicine, Vol. 200, Issue 7, pp. 587-99, 2004 Method employed by authors: Flow Cytometry (FACS), Flow Cytometry (FACS), Flow Cytometry (FACS) (Sample species: Human).